Local SEO drives customer actions for businesses of every size, from local mom-and-pop shops to large companies with multiple locations. Local SEO is the new storefront, as search is now consumers’ top choice for finding local businesses. Local is a strategic investment within your sales funnel; it impacts your organic search strategy, content marketing efforts and paid advertising investments. It ensures overall marketing effectiveness. But how do you maintain and continue to drive action for local businesses, and even enterprise brands with multiple locations? What challenges do franchise-level brands face? Local SEO has become a strategic investment for many franchise businesses because the results affect the company at scale. With the rapid increase of location-based searches, it’s key to capture and harness this growth to ensure your brand’s success. Franchise-level brands have massive amounts of existing inventory, data and locations they have to manage every day. It can be challenging for multi-location brands to strike a good balance between efficiently managing data across all locations and meeting the individual needs of each location through things like localized content. Through centralized data management systems like Moz or Yext, brands can create consistency across website location pages and local listings. This technology minimizes a brand’s time managing the vast amount of information like a location’s NAP (name, address and phone number) and helps to expedite any updates to their chosen data partner. But to say bulk data management and updates are enough to guarantee local success would be misleading. Strategic localization is needed to compete at top positions during a consumer’s peak moment of interest. Alongside centralized data management, brands will need to invest in unique and localized content, inbound location page links, hyperlocal keyword insights and structured and unstructured citations. Brands with several locations that seek to perform well in local search and map results require a different approach to their local SEO from the mom-and-pop shop down the road. These brands have to consider the unique customer behavior and service or product offerings by region, varying store hours and promotions, compound data, franchisee education, strategic guidance and the frequency of store closing and openings. Simply put, that’s a lot to maintain. But with a strategic localization approach, brands can speak to people nationwide, regardless of the different terminology someone may use in the Deep South compared to the West Coast. For example, think of the way we order pizza. In Denver, it may be referred to as a “pizzeria restaurant,” while elsewhere it is called a “pizza shop,” “pizza place,” or “pizzeria.” While the terms all mean the same thing, the region determines the bases. Local keyword insight based on your business locations is crucial for creating unique content that’s personalized for local searchers. Local SEO success is often considered synonymous with strong performance in the Local 3-Pack or Google Maps. Indeed, Google My Business provides insights into many metrics related to local search performance, including local pack impressions, clicks for directions, website clicks and phone calls. However, in order to maximize your business locations’ search visibility, you need to focus on more than just optimizing your Google My Business listings. The rest of the SERP can direct users toward relevant pages, too, helping to assist your local efforts. Traditional organic search optimization efforts made with local in mind can improve your business’s search presence in relevant local markets. If a user’s search query doesn’t indicate a location explicitly, Google can often tell contextually that the user is interested in shopping around in the area, and local-based SERPs results will appear instead. For example, for the search query “used ford explorer” (below), Google narrowed down its search results based on local inventory of the Ford Explorer. Why are the sites highlighted above performing so well in organic search for implied local queries? 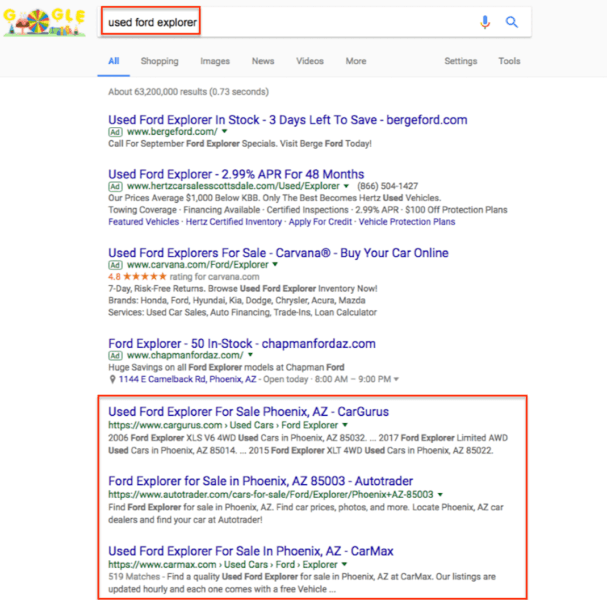 Google rewards websites that are easy to crawl — and using structured data to ensure that Google can understand and evaluate your inventory every time someone searches for a product you have (say, a used Ford Explorer) improves your chances of showing up for these types of queries. Google tailors its search results taking into account many different factors, like the proximity to the searcher or the amount of product inventory available at that location, so it’s important that your local business pages contain this information in a way that is clearly presented and easily crawled. It’s important to re-evaluate your intent-focused search terms so you’re not leaving any money on the table in regards to your localized efforts, from bottom all the way to top of the funnel. Many factors contribute to local SEO success. Centralized data management is important to maintain NAP consistency across the web, but you should take into account a multitude other factors — such as links, citations and unique, localized content — in order to capture potential customers at the right place and time in our current search landscape. It’s essential to utilize all efforts to garner local success and expand beyond in order to continue growing.